If you have a high-demand workload environment and want to understand the benefits of the improvements in RDS and Infiniband, please join Director of Linux Kernel Engineering, Chris Mason as he discusses scalability and performance improvements in the Linux environment. They will also talk about tuning the software stack, tools used in determining bottlenecks and addressing them as well as overall performance improvements and benefits in Infiniband and RDS. You will walk away with a better understanding of why Linux is able to scale better on 8-socket systems. Oracle is the only company that provides complete Linux solution stacks from apps to disk along with one stop support. As part of the Linux mainline kernel community, Oracle’s engineers contribute in advancing Linux for mission critical deployments. Oracle Linux is the culmination of work with the mainline community and Oracle’s own product development teams. Did you know that Oracle Linux is the only supported Enterprise Linux distribution that is available for free download and distribution? Red Hat Enterprise Linux is not. SUse Linux Enterprise Server is not. Oracle has been offering affordable Linux support since 2006 and more than 6,000 customers already use it. Oracle’s Unbreakable Linux support program draws on the expertise of a world-class support organization that understands how to diagnose and solve Linux issues integrated with the applications being deployed on it. Find out how you can save 50-90% on your support costs. If you are going to get free access to the most advanced Linux operating system, along with world-class support at a fraction of the cost, better testing and integration with your server and applications, why wouldn’t you do it? Increasing complexity and growth in data centers have led to significant concerns about silent data corruption. Without an end-to-end protection technology, data corruption can go unnoticed until recovery is difficult and costly, or even impossible to perform. Database administrators face many challenges in developing and supporting applications that are often the lifeblood of their organization. One of the concerns is the integrity of data as it travels through the storage area network (SAN) between servers and storage arrays. Please join Martin Petersen, lead Linux kernel developer at Oracle and Sergio Leunissen, Senior Director, Linux Product Management as they talk about the latest technology innovations that help eliminate silent data corruption in Linux environment. 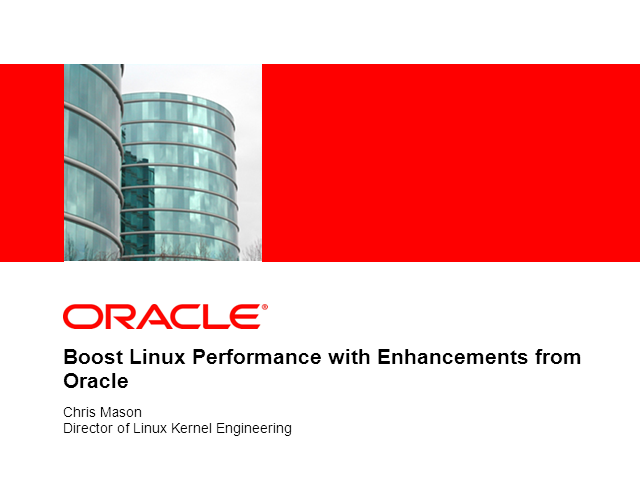 They will discuss the new features in Oracle's Unbreakable Enterprise Kernel for Linux that reduce the potential for incorrect data to be written to the disk, decreasing application and database errors and system down-time. Customers now have access to comprehensive data integrity capabilities across the entire Linux stack, allowing them to reduce costs while increasing efficiencies and uptime. And what's even better is that Oracle Linux plus the new kernel is available for free download and use. You can get 24x7, global support through Oracle Unbreakable Linux Support program. Join Oracle's Linux guru Wim Coekaerts, Senior VP, Linux and VM Engineering, and Monica Kumar, Senior Director, Product Marketing talk about key benefits of using Oracle Linux with Unbreakable Enterprise Kernel, and get answers to all your questions about Oracle and Linux. Oracle Linux combined with Oracle's Unbreakable Enterprise Kernel brings the latest Linux innovations to market, delivering extreme performance, advanced scalability, and reliability for enterprise applications. Get the latest news on Oracle Linux from Oracle's lead experts. This channel includes a monthly webcast series focused on the Oracle Linux technologies.